Following a successful visit to China in November that resulted in the US-China joint statement on climate change, President Obama is India. On Sunday, he achieved further success through bilateral cooperation between India and the US countries that focused on addressing climate change and energy issues. Both countries concluded negotiations on a five-year MoU on energy security, clean energy and climate change and an agreement to this effect expected as early as possible at a mutually agreed date. Prime Minister of India negated the assumption that US- China statement on climate change pressurised India to collaborate with the US. While refuting the assumption he also added that his country’s decision to collaborate with US as a rightful duty to the future generations, bringing the focus back to the famous and India’s (probably) favourite element of climate negotiations for India – equity. In this case inter-generational equity. He also pointed that the need for a global deal on climate change as the reason to move onto a collaboration with US. The PM of India at a news conference on Sunday said, “When we think about the future generations and what kind of a world we are going to give them, then there is pressure”. “Global warming is a huge pressure,” he added. A key element of collaboration between the two countries is bilateral climate change cooperation. This includes not only US and India working together, but also working with other countries on climate change. This in turn would give hope that the expectation is to cooperate closely this year to achieve a successful and ambitious agreement in Paris. Speaking on the Paris climate talks, the President of the US highlighted the need for India’s voice to be raised in a positive manner if a global deal is to be achieved in 2015. During the Conference to be held in Paris 196 countries will meet and negotiate on a course to address climate change. If urgent and ambitious actions are not made the global average temperature will be on track to levels that will be threatening for human survival on the planet. Given these reasons, the negotiations in Paris will play a decisive moment for all, especially for the most vulnerable states and communities of the world. India and USA also pledged to enhance cooperation on the energy sector. While welcoming India’s intention to increase the share of renewable energy in electricity generation consistent with its intended goal to increase India’s solar capacity to 100 GW by 2022, USA intends to support India’s goal by enhancing cooperation in clean energy and climate change. The two countries already has a U.S.-India Partnership to Advance Clean Energy (PACE) umbrella program, and highlighted its willingness to expand policy dialogues and technical work on clean energy and low greenhouse gas emissions technologies. US-India deal also provides for the expansion of Partnership to Advance Clean Energy Research (PACE-R) a $125 million program jointly funded by the U.S. and Indian governments and private sector. The renewal includes extending funding for three existing research tracks of solar energy, building energy efficiency, and advanced biofuels for five years and launching a new track on smart grid and grid storage technology. Further, this includes accelerating Clean Energy Finance. The US will also work on demonstrating clean energy initiatives on the ground including additional pilot programs and other collaborative projects, as well as developing an innovative renewable energy storage project and hosting a smart grid workshop. However this collaboration is not restricted to energy, but also includes fields of science, technology, innovation and agriculture. A developing country, India is also world’s 3rd largest emitter of green house gases. Although the need for cutting down emissions remains vital, the need for economic growth and reduction or poverty also plays a key role in India’s economy. In order to address the issues of development, while putting the country on a low carbon emitting trajectory, India needs to move for a rapid expansion of renewable energy. In this venture, the country needs investment and technology, and improving energy efficiency. It is to fill this gap that further US will provide financial support for India’s solar program. “We very much support India’s ambitious goal for solar energy and stand ready to speed this advancement with additional financing,” said President Obama at a news conference in Hyderabad. For developing countries, a fact that remains important in the shift to a low carbon trajectory is the price of renewable energy. This would be the reason as to why one of the requests from the Indian PM to Obama has been to ensure that renewable energy more accessible and affordable. 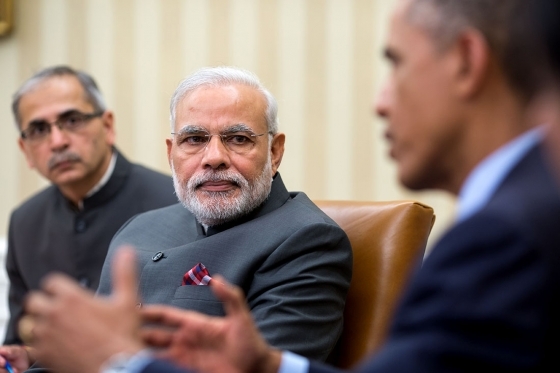 PM Modi has shown interest in the expansion of renewable energy as a way to mitigate country’s large-scale emissions. This shift could be seen as a sign that India is becoming positive towards achieving a global climate deal in Paris, end of 2015.The Prime Minister is reported stating that his nation along with all others has an obligation to act on reducing the fossil-fuel emissions blamed for damaging the climate. The two countries also succeeded in forming a pact on nuclear energy allowing American companies to supply India with civilian nuclear technology. The nuclear deal which was held up for six years amid concerns over the liability for any nuclear accident has been finalised by setting up a large insurance pool allowing the deal to move forward without further need for legislation. In the words of PM Modi, this marks a “new journey” of co-operation, with stronger defence and trade ties between US and India. The question is whether shifting to clean energy could be interpreted as a shift to nuclear energy, which is without carbon emissions yet equally dangerous as an energy source due to threats that it poses. If the assumption that cutting down emissions and shifting to renewable energy equals introducing nuclear energy as the solution, and other countries take heed and adopt the trend, it will not be a solution to the threats posed by climate change but another situation that needs to be dealt with caution.